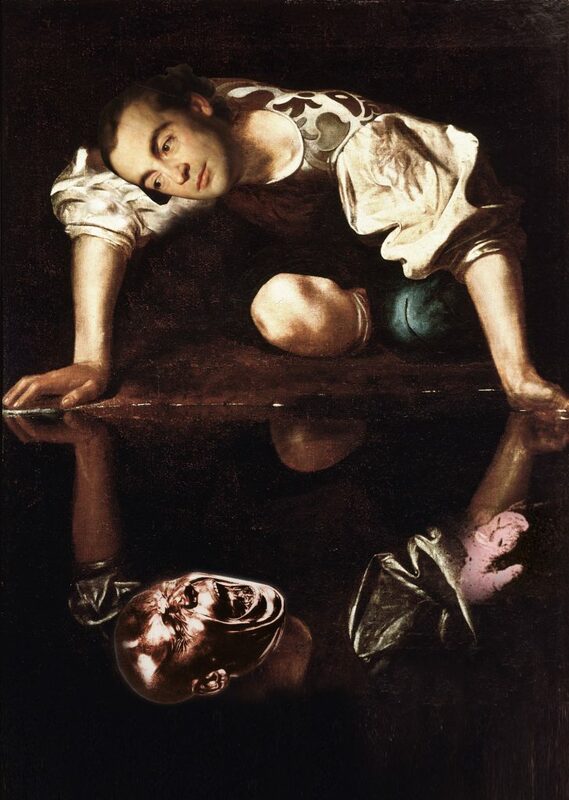 The work “Spiegelung (Narziss)” is a col­lage based on Caravaggio’s paint­ing “Nar­cis­sus”, one of the most wide­ly known art­works deal­ing with the top­ic of mir­ror­ing. 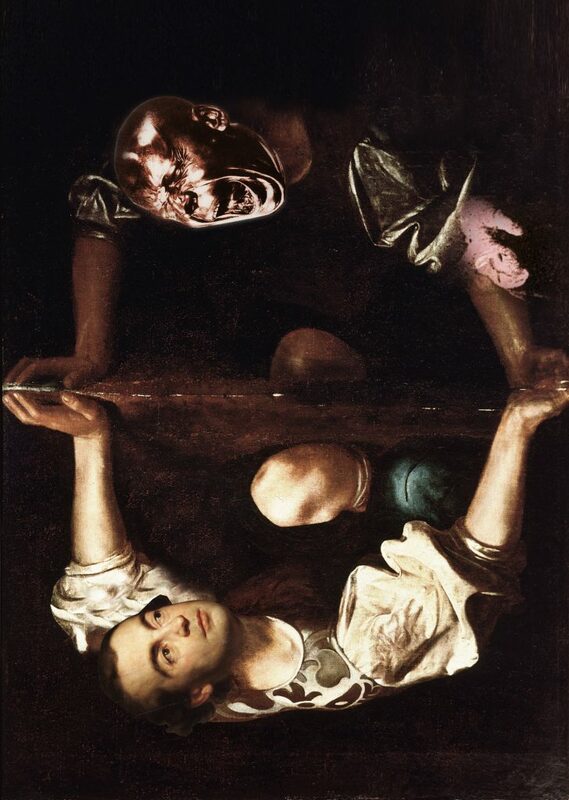 The strange scene seems to depict a demon­i­cal set­ting, which is expressed, most of all, by the fact that the mir­ror image form­ing on the dark water sur­face does not reflect Nar­cis­sus, but some­body else. In the mir­ror image the har­mo­nious face of Johann Joachim Winck­el­mann – assum­ing the place of Nar­cis­sus – is trans­formed into the dis­tort­ed gri­mace of a sculp­ture by Franz Xaver Messer­schmidt. The bright and even-tem­pered is con­front­ed by the obscure and unfath­omable as its coun­ter-image. To which strange laws of physics (or psy­chol­o­gy) does this mir­ror-scene adhere? And which one of the depict­ed char­ac­ters is the ‘orig­i­nal’ and which the mir­ror image? The pro­tag­o­nist Nar­cis­sus, ema­nat­ing from Ovid’s Meta­mor­phoses, becomes a screen, onto which var­i­ous per­son­al­i­ties can be pro­ject­ed. Even­tu­al­ly the por­trayed mir­ror-scene does itself assume the func­tion of a mir­ror, in rela­tion to which the view­er posi­tions him­self.